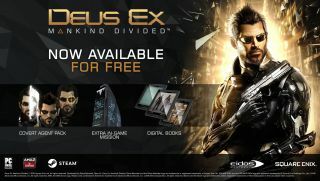 Square Enix offered a bunch of digital goodies as bonuses for pre-ordering Deux Ex: Mankind Divided: an additional in-game mission, a few character and weapon skins, and a bunch of free consumables to sully the balance of the game. That's not uncommon these days, but it's usually followed a few weeks or even months later with those same bonuses cropping up as paid DLC. That hasn't happened here. Square Enix has instead made the pre-order content available for free, for everyone (it will be automatically added to your game via an update, the next time you load up Steam). The bundle comprises "the Desperate Measures extra in-game Mission, a compilation of skins for Adam's armor and trench coat, a re-skinned pistol and combat rifle, and various consumables", along with some digital books including a novella and comic that you can download gratis here. But wait, there's also a small patch that "fixes an issue where the weapon inventory bar would not be saved online", that "fixes some crash issues occurring with specific save files from users", and that also properly aligns the 'Quit Game' option on the menu. I haven't played Mankind Divided, but that last one would bug me, so hooray.